Nordkapp - it was our final destination and the furthest North we could go in Continental Europe. It took us 67 days to get there and we've travelled 4,360 miles, and today was our turnaround day, and the one on which we will start our homeward journey. However, we're not in any hurry and our plan is to take another 10 or 11 weeks to reach our home town of Ripley! 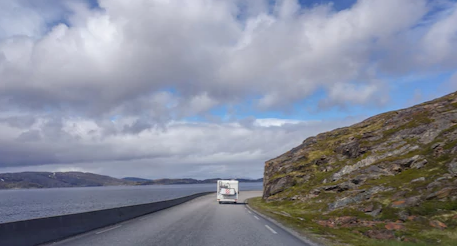 So for now I'm going to stay in full tour mode and tell you all about Nordkapp and our impressions of it! 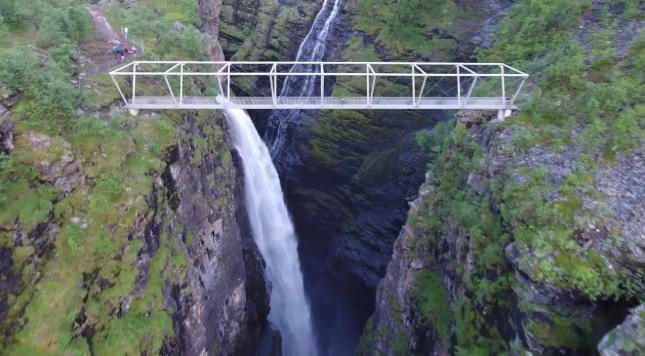 However, that task is almost impossible and probably way beyond my ability because although it's something of a tourist trap, it's truly a spectacular venue to visit. 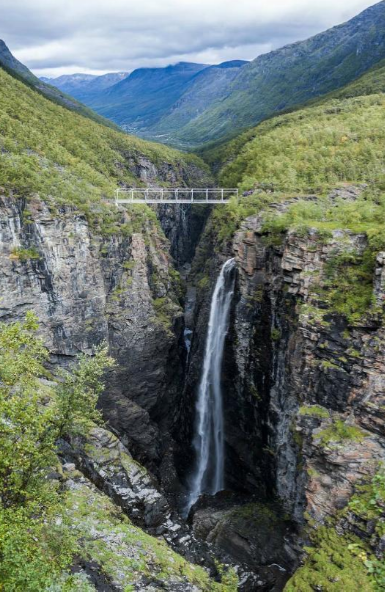 It attracts about 200,000 visitors a year (mostly in the summer), and they arrive to pay their 275 Nok each (£26) entrance fee by all manner of transport - walkers, cyclists, bikers, cars, motorhomers, and also by the coach load. Then once you've coughed up your dosh your ticket entitles you to a 24 hour stay to explore the massive visitors centre (which was much more interesting and informative that I expected), and also the surrounding craggy land that ends at a high convoluted cliff that drops many metres down jagged cliffs to the Barents Sea below. When we first arrived just before lunch time we went for a walk along the cliff edge, and as there were no paths or fences we found ourselves just wandering in the wilderness areas away from the buildings - and we really didn't have to go very far before it seemed as if we'd left every single living soul behind - except for each other of course! Our meander lasted for about an hour but then our growling bellies drew us back to T4rdis2 where we consumed generous helpings of stilton and broccoli soup before we ventured out again - this time to explore the visitor attractions. First up was the Globe Monument which was erected in 1977 and seems to be the thing that most people flock to for pics to prove they've been here! Next we visited The Children of the World Monument which in 1989 was designed by seven children from various parts of the globe to symbolise collaboration, friendship, hope and happiness. St. Johannes Chapel which was tiny but consecrated, and The Thai Museum which commemorates the visit of King Chulalongkorn of Siam to Nordkapp in 1907. Then after all that we were ready for a rest so we went and watched the Panorama Film which took us on a journey over land, sea and mountains in many different weather conditions all of which demonstrated how it might be to live here year round. While we were there we also learnt how the Aurora Borealis occurs in a step by step instruction! To understand how the northern lights occur you need to travel about 150 million kilometres out into space! Sometimes these magnetic fields extend so far that the magnetic threads are broken and an enormous bubble of billions of tonnes of plasma is hurled out into space creating a sun storm. When the sun storm collides with the Earth's magnetic field it is deflected in two directions around the earth. The two magnetic fields rejoin on the night side and particles are thrown back along the magnetic threads down towards the Earth's magnetic poles. Here they collide with atoms and molecules high in the Earth's atmosphere and make the glow that is the phenomenon known as the Aurora Borealis! There was also another one that told you all about the midnight sun which was something to do with the earth's 23 degree tilt on it's axis, but I'm not going into detail cos I don't want anyone to 😴😴😴 off while there reading! Anyway, after we'd done improving our knowledge we had an obligatory browse in the gift shop where the only thing we brought was a Nordkapp sticker for the back of the van, and then we returned to T4rdis2 so that I could do all my prep work for John's birthday supper. We finished eating about 8.30, so to kill some time while we waited for the midnight sun we went out for another short walk, but by now a 🌀hooley🌀 was blowing and it was ccccc-cold, so even though we were happy to be out drinking in more of the stunning scenery we were also quite glad to return to T4rdis2's warm confines. From there our cab provided us with ring side seats of the sun clouds and the sea, but right up till the last minute we were teased as the racing clouds chugged quickly across the sun obliterating it from our view. However, our luck was in, so at 11.55 we braved the cold again and nipped out to enjoy the dramatic display of an angry looking sky that frequently allowed the sun to peek though the masses of rolling frothy cloud. It really was a quite magical experience and one that was well worth missing a bit of sleep for! But by morning I think we'd both missed more than a bit of 😴😴😴 because the fierce wind had jostled and swayed T4rdis2 quite alarmingly for most of the night, so that on top of the wee dram (or three) we'd consumed while waiting for midnight left us both a bit reluctant to leap up and face the day! However, another journey needed to be done so we so after 3, we leaped - and once our feet had touched the cold floor it wasn't so bad! 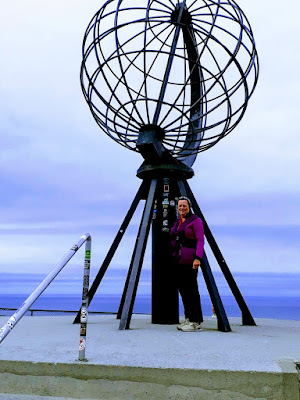 Now, the bit I seem to have missed out in this story is about our journey to get here, but as we were required to retrace our steps to leave Nordkapp I'll just tell you about that instead. I think one of the main events were the tunnels of which there were 5! Two very short ones, one of about 600 metres, one of nearly 5 km and the one to get onto the island of Mageroya (where Nordkapp can be found) was nearly 7 km, it goes under the fjord, and as we entered I wondered if we should have been equipped with a snorkel - but we were fine - T4rdis2 didn't even have wet wheels when we emerged. The vistas we saw included towering granite rock faces that sometimes looked a bit like a Jenga game just before it topples, and in places it had toppled forming huge boulder strewn scree slopes! There were miles of sometimes steep hills covered with lichen, heather and scrubby grass much of which was inter-spaced with small lakes and reindeer fencing, and also as we drove along the narrowish road that very tightly hugged the coast our eyes drank in the distant miles of sea that seemed to change colour depending on the angle from which we were looking. Then mixed in with all that we spied occasional dwellings perched in precarious positions that couldn't possibly have had modern services like electric and drainage! At one point as we were passing a little beach John said ' Oh look, there's a donkey down there' but it was a very funny looking one! Today our target was the town of Hammerfest which claims to be the most northern town in the world. It lies on another island in West Finnmark and we reached it by passing over the Kvalsund Suspension bridge and then driving along a road that once again hugged the coast on one side and had more naked rocks on the other. Hammerfest is also one of the oldest towns in Norway despite several attempts by men and Mother Nature to remove it from the map! In 1856 a hurricane more or less blew it away, and in 1890 it was ravaged by fire, but apparently the worst atrocity was inflicted by the Nazis in 1945 when an order was given to 'leave no building standing'. However, it has now been rebuilt and has offered us a very nice camping spot right on the water's edge opposite it's harbour, and once we'd got settled in we toddled off to see The Meridian Column which is made out of marble and commemorates the first survey (1816 - 1852) made by a Russian Scientist to determine the arc of the global meridian and thereby calculate the size and shape of the earth. Amazingly, when this was repeated using satellite technology he was found to be only a couple of hundred metres out on the equatorial radius so he very nearly got top marks! 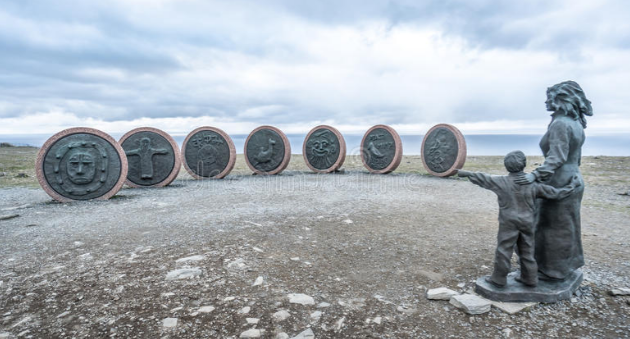 The column is now on the UNESCO World Heritage list, but unfortunately, although it represents a monumental achievement it's surroundings weren't overly picturesque - or maybe it's just that Nordkapp has spoiled us a bit! This morning we left Hammerfest just as a cruise ship was pulling in - so possibly just in time to avoid the huge crowds that were likely to be allowed out to play for a while! Our first stop was at the Rema 1000 supermarket to top up our food cupboards but while we were there I made a little mistake - I've already moaned about the price of food but when I got round to checking my receipt I realised I'd paid the equivalent of an eye watering £7.30 for a small bag of spuds! And after that 'excitement' we continued today's long journey southwards, and other than a few more reindeer encounters, more tunnels and exposure to more lovely views there wasn't anything else eventful enough to write about. 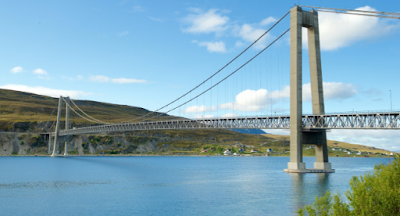 I think that's possibly because we're mostly rolling back over the same ground as we did on our trek North, and that's going to continue until we get into the Narvik region and from there we'll branch off and head onto the Lofoten Islands. This morning we left our free parking spot that had provided a peaceful night even though it was quite close to the E6 and travelled a little over 50 miles the Reisa National Park, and our purpose for doing that was our desire to visit the Gorsa Bridge. 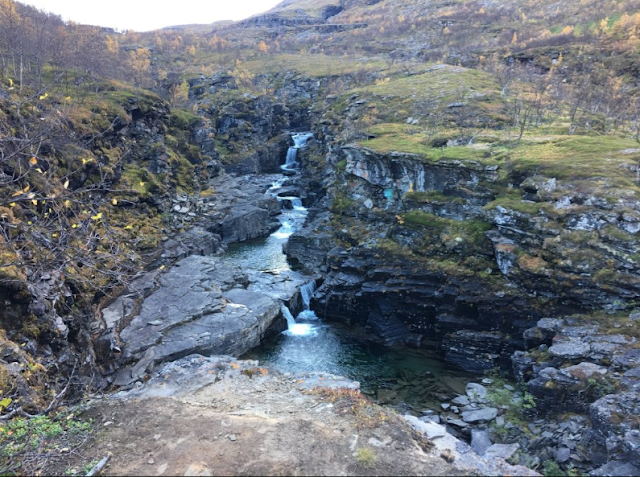 The Bridge lies deep in the Kafjorddalen valley and is about 15 km away from the E6, so to get there we needed to leave the main road behind and proceed first along a sealed but very rough track, and then for the last 3 km along a gravel road where we had the company of sheep! However, once we arrived at our designated parking area we quickly decided that it had been worth the effort and once our brake had been applied it wasn't going to be released until tomorrow morning! After the main part of the old mine we continued along a way marked path that led us past various information boards that explained the functions of the ruins and how the ore was extracted, and then the trail continued uphill through meadows and stumpy forests. Then as we neared our goal our way became steeper, rougher and narrower with shallow streams crossing our path and slippery climbs to negotiate, so at that point we decided we wouldn't be coming back via the same route. Instead we'd cross over the bridge and make our way back via the easier track on the other side of the gorge. Besides the bridge the waterfalls were also quite magnificent, and although there was only one main torrent there were also several other smaller ones which added their contribution to the river below. By taking the easy route our return journey was quickly completed and once home we rewarded ourselves with a nice cuppa and a slice of cake while we discussed where our next venue will be! As yet it's still to be decided but we're very firmly keeping our fingers crossed that it will be somewhere equally as spectacular as this!